A confined setting in which a group of strangers confront a threat to their lives is a classic scary movie trope. The emergence of tensions, hostilities and ulterior motives amidst ordinary humans just adds a certain richness to the whole waiting-to-get-picked-off-by-a-bloodthirsty-foe thing. In this confident second feature by UK director Paul Hyett (The Seasoning House), written by Mark Huckerby and Nick Ostler, the trap is a broken-down train stranded in English countryside, the passengers a convincingly yucky assemblage of normal Brits, and the danger provided by something howling and hungry in the forest outside. 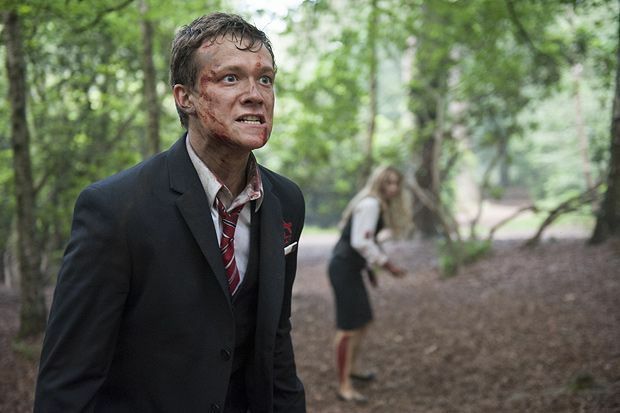 Working the late-night shift on a depressing commuter route are put-upon guard Joe (engagingly played by Ed Speleers) and catering assistant Ellen (Holly Weston), whom he is nervously keen to court. Such priorities are rapidly overridden when the train stops, the driver vanishes, and it becomes apparent that those on board have rather more to worry about than a tedious wait in obnoxious company. The film’s clearest potential limitation – the extremely restricted physical space in which it takes place – is rather brilliantly overcome, and indeed turned into an advantage. The lack of any back-story regarding the film’s monsters (where did they come from? What have they been eating up to this point?) gives the film a bit of a flimsy feel, however; and its third act could have done with an additional twist or development, without which the energy dissipates a little. However, the way in which Hyett and his writers blend the quotidian irritations of work and other people into a building nightmare is skilful, with each character given enough of an edge for their motivations and ultimate survival to be questionable, without anyone being rendered merely disposable. The black humour hits home without breaking the tension, while the gore – as one might expect given Hyett’s background in makeup effects – is grimly convincing. Selected release from Fri 16 Oct. When a late night commuter train stops in the countryside in the middle of the night and the driver vanishes, ticket collector Joe (Speleers) and catering assistant Ellen (Weston) are among those trapped on board. Skilful and intelligent, if a bit flimsy, with decent characterisation and grimly convincing gore.